CONCENTRATED 1000 mg OMEGA-3 FOR MAXIMUM RESULTS: our high dose, high concentration fish oils deliver higher amounts of omega-3 into cells where they can get to work fast. By raising the percentage of EPA and DHA in red blood cells to approximately 10%, we improve long-term health and reduce disease risk. 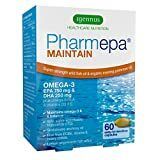 Pharmepa MAINTAIN contains 80% omega-3 concentrate in triglyceride (rTG) form, offering 750 mg EPA and 250 mg DHA per serving, in small capsules that are easy to swallow. PHARMACEUTICAL-GRADE: Igennus Healthcare Nutrition supplements are produced in facilities that manufacture in compliance with strict and stringent GMP (good manufacturing practices) – quality standards that medicines manufacturers must meet in their production processes to ensure products are of consistent high quality. Pharmepa MAINTAIN is ideal for long-term health maintenance and provides intensive support for heart and eye health, brain function and mood balance. THIRD PARTY TESTED: to ensure purity, active ingredients, nutritional value and safety. This product has passed strict controls authorising its use in human clinical trials as evidence of its exceptional quality. Our product is dairy-free, gluten-free, lactose-free, yeast-free, GMO-free and contains only natural bioavailable ingredients (Halal & kosher) and no artificial colours, flavours, preservatives or artificial sweeteners. PROTECTED AGAINST OXIDATION: ultra-concentrated omega-3 oils need extra protection against oxidation so we ensure our supplements are constantly protected from air exposure. Our oils remain under a nitrogen cap until encapsulated and are packaged in protective individual blister packaging, with the antioxidant protection of vitamin E. This prevents the production of peroxidase products, with no need for refrigeration during storage or transport. Containing pharmaceutical-grade 80% Omega-3 concentrate, Pharmepa MAINTAIN is more than 2.5x the strength of ordinary fish oil and is an excellent source of both EPA and DHA. The body requires a regular intake of certain fatty acids to maintain Omega-3 and Omega-6 balance. Pharmepa MAINTAIN contains an optimal ratio of 750 mg EPA, 250 mg DHA and 60 mg GLA for lifelong health, with additional support from vitamins D3 and E. This supplement provides high intensity support and is ideal for long-term health maintenance for those who are already in good health, or continuation after Pharmepa RESTORE, which provides a loading dose of pure EPA. This fish oil is in a very absorbable re-esterified triglyceride form and offers exceptional purity. Nature-identical triglyceride (rTG) omega-3 is the most effective form of omega-3 at delivering EPA and DHA directly into cells where they are needed most. Support for heart and eye health, brain function and mood balance EPA is a long-chain omega-3 fatty acid under constant demand to be replaced in the body, as it plays a crucial role in so many processes – from brain function and cognition to heart health, triglyceride and cholesterol management, inflammation regulation and immunity. DHA is an important structural fatty acid and cellular levels are tightly regulated to ensure cell membranes are flexible and permeable so that cells function optimally. A high EPA to DHA ratio of 3:1, coupled with the daily intake of 250 mg DHA required to maintain structural integrity of cells, provides benefits for the heart, brain, eyes and body as a whole. Evening primrose oil is a rich source of the omega-6 fatty acid GLA. GLA is an integral part of cell membranes, helping to keep them permeable for optimum brain function, as well as being a precursor to favourable eicosanoids. Our cold-pressed and non-raffinated oil is a botanical source of triterpenes- free radical-scavenging substances, which may help to support the immune system.